President Trump appears to have lost control of his administration – after officials went ahead to scrap anti-discrimination protections just days after the President intervened. Last week the President said he would not repeal Obama’s executive protections for LGBT people, with Ivanka Trump and her husband Jared Kushner said to have convinced the President to ignore his strategists on the issue. In a official statement just days ago, the White House claimed: “President Donald J. Trump is determined to protect the rights of all Americans, including the LGBTQ community. President Trump continues to be respectful and supportive of LGBTQ rights, just as he was throughout the election. 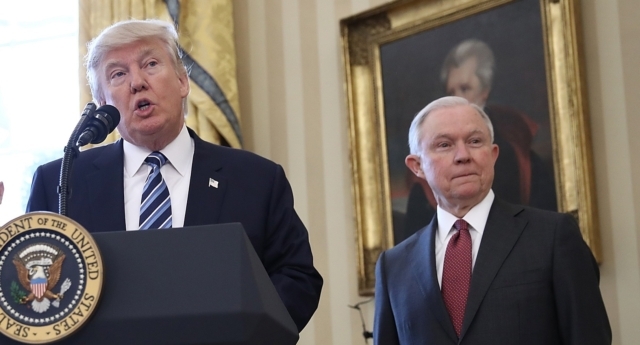 However, despite Trump’s assurances, it emerged over the weekend that newly-confirmed Attorney General Jeff Sessions has pulled the federal government’s legal support for Obama administration anti-discrimination protections for transgender students. The implementation of the educational anti-discrimination protections were previously postponed after a legal challenge from a string of Republican states. The case was meant to be heard this month, but rather than defend the protections, Sessions filed a bid to postpone the court date indefinitely – meaning the order will likely never come into force as the case may never be heard. The government’s short court submission says: “Defendants-appellants hereby withdraw their pending November 23, 2016 motion for partial stay pending appeal. “The parties jointly move to remove from the Court’s calendar the February 14, 2017 oral argument currently scheduled for that motion. The protections for school students, while distinct from the executive order protecting LGBT workers, fundamentally applies the exact same principle of LGBT non-discrimination as the order that Trump claimed to support. Activists believe the shift shows just how little control the President has over his Cabinet, given Sessions’ long record of anti-LGBT activism. Human Rights Campaign President Chad Griffin said: “After being on the job for less than 48 hours, Attorney General Jeff Sessions has signalled his intent to undermine the equal dignity of transgender students. “Transgender students are entitled to the full protection of the United States Constitution and our federal nondiscrimination laws. “It is heartbreaking and wrong that the agency tasked with enforcing civil rights laws would instead work to subvert them for political interests.